April 12, 2018, 7:31 a.m. Fewer than a quarter of Britons (22%) say they would support these attacks, with almost twice as many opposing (43%). 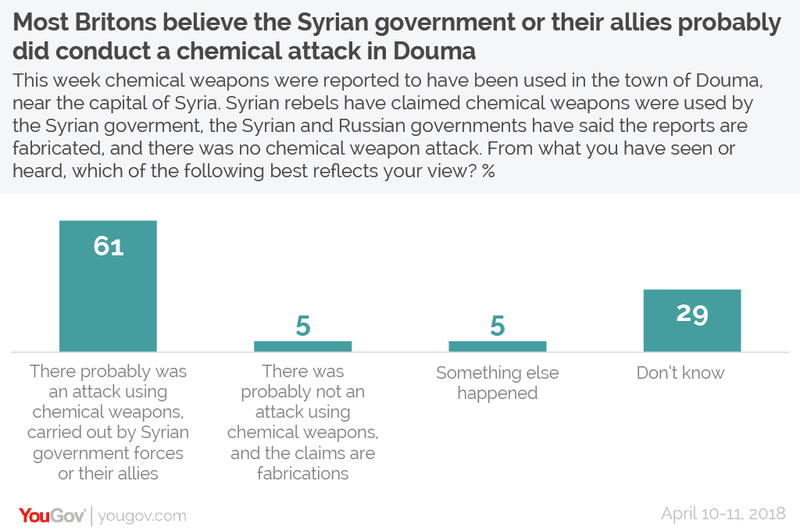 This is despite the fact that the majority of Britons (61%) believe that the Syrian government or their allies probably did carry out a chemical attack. Only 10% think that either there probably wasn’t a chemical weapons attack or that something else happened. The remaining 29% said that they don’t know. Across all parties voters are more likely to oppose than support missile strikes, although Conservative voters are the most evenly split with 34% in opposition and 33% in support. As we have seen in past research, such as when we last looked into RAF strikes against ISIS back in 2015, there is a dramatic gender gap. Only 14% of women support missile attacks, with 47% opposed. Amongst men those figures are 31% and 40% respectively. The question on missile strikes was one of several on possible interventions we tested this time around (or equivalent to show we’re back to talking about current stats). Options to send in British and allied troops to either protect civilians or depose President Bashar al-Assad see even higher levels of opposition (50% for the former, 51% for the latter). However there is majority support for the enforcement of a no fly zone over Syria, with six in ten (60%) saying they would back such a measure and less than one in ten (9%) opposed. 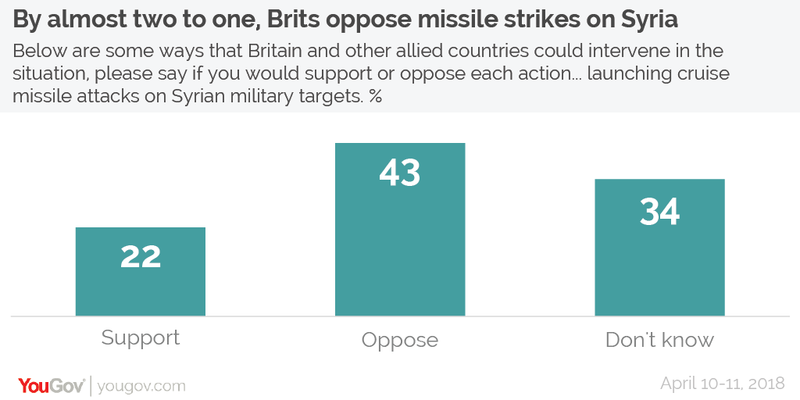 There are some indications that this opposition to strikes could be prone to change with, for instance, the fact that a third of Brits (34%) saying they don’t know whether they would support or oppose missile strikes. In the past we have seen support for foreign interventions fluctuate as events develop. 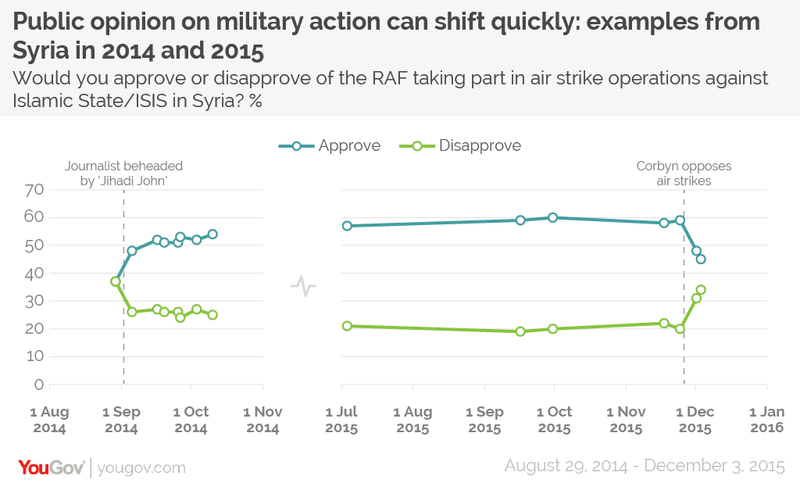 A good example of this is when YouGov tracked public opinion towards RAF strikes against ISIS in Syria during 2014 and 2015. At the end of August 2014 the numbers were finely balanced, with 37% in support and 37% opposed. Just a week later, after the release of a video in which an Israeli-American journalist was beheaded, support jumped up to 48%. 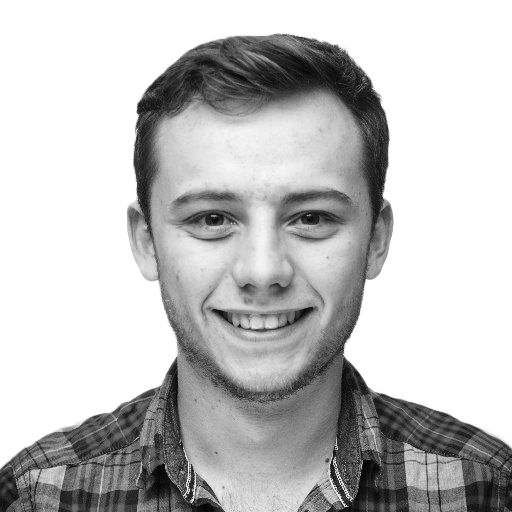 Support then peaked at 60% in September 2015 before dropping back down to 48% by December, after Jeremy Corbyn came out against the strikes. So while there is currently strong public opposition to cruise missile strikes, the events of the coming days, and the way political leaders respond, could lead to further shifts in public opinion.